Whats more welcome than a festive mix of cheerful blooms? How about a mug to remember it by. Fill their morning cup of Joe with a reminder of how much you care. 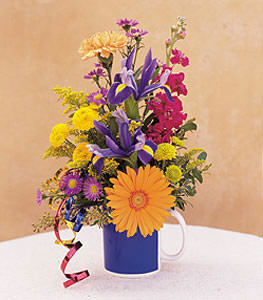 Iris, chrysanthemums and a gerbera arrive in a stylish mug with curling ribbon.